This is a utility class that provides an abstraction for the common functionality between Instructions and ConstantExprs. Definition at line 30 of file Operator.h. Definition at line 56 of file Operator.h. 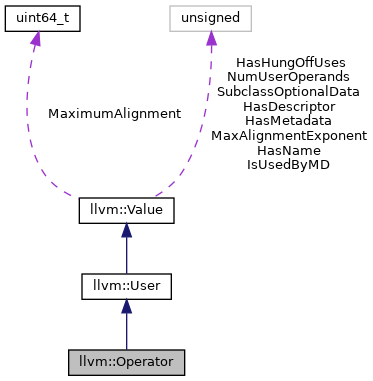 Referenced by llvm::OverflowingBinaryOperator::classof(), llvm::PossiblyExactOperator::classof(), and llvm::ConcreteOperator< Operator, Instruction::PtrToInt >::classof(). Definition at line 57 of file Operator.h. Definition at line 58 of file Operator.h. Definition at line 40 of file Operator.h. 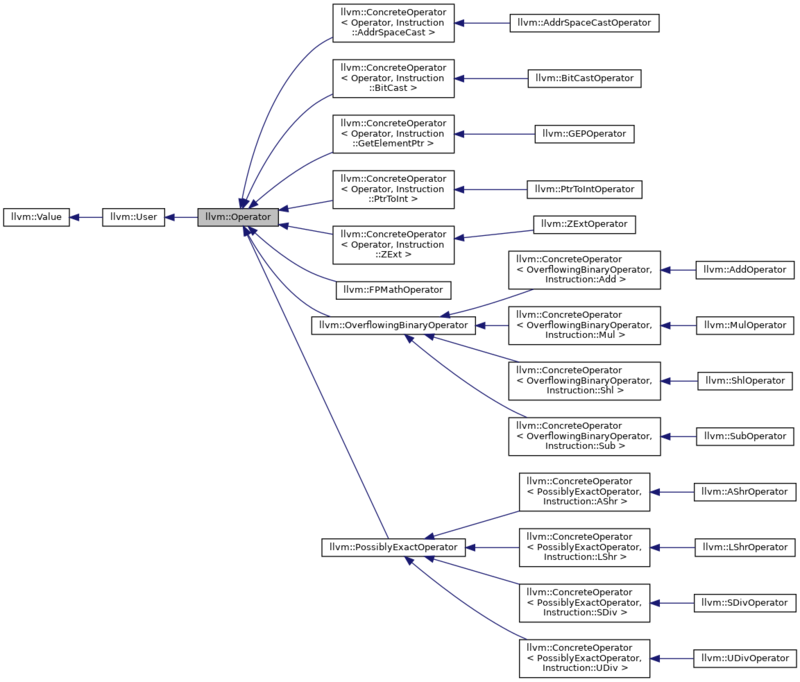 Referenced by cannotBeOrderedLessThanZeroImpl(), cloneConstantExprWithNewAddressSpace(), computeKnownBitsFromOperator(), llvm::ComputeMultiple(), ComputeNumSignBitsImpl(), llvm::ComputeSpeculationCost(), getAdjustedPtr(), getBrevLdObject(), getMaxPointerSize(), llvm::GlobalsAAResult::getModRefBehavior(), llvm::GetPointerBaseWithConstantOffset(), getPointerOperands(), getRangeForAffineARHelper(), llvm::GetUnderlyingObject(), getUnderlyingObjectFromInt(), llvm::getUnderlyingObjectsForCodeGen(), llvm::TargetTransformInfoImplCRTPBase< AMDGPUTTIImpl >::getUserCost(), INITIALIZE_PASS(), isPointerValueDeadOnEntryToFunction(), llvm::isSafeToSpeculativelyExecute(), mergeConditionalStoreToAddress(), PushDefUseChildren(), llvm::recognizeBSwapOrBitReverseIdiom(), llvm::Value::stripAndAccumulateInBoundsConstantOffsets(), and stripAndComputeConstantOffsets(). If V is an Instruction or ConstantExpr, return its opcode. Definition at line 48 of file Operator.h.